Hurvin Anderson is a British painter, born in 1965 in Birmingham, United Kingdom, to parents of Jamaican origin. His education, he got at Wimbledon School of Art, which he enrolled in 1991, and received a BA with Honors in painting, in 1994. His MA in painting he got at Royal College of Art, London, at which he studied from 1996 till 1998. His series of paintings titled Peter’s, that are depicting the interiors of barbers’ shops, in particular one, owned by Peter Brown, which Anderson was visiting often with his father when he was a child, are probably his most famous works. These works are inspired by his upbringing in Birmingham’s Afro-Caribbean community, in which the shop that is theme in Anderson’s paintings was a place for conversation as well as for cutting hair. It was a social retreat, vital for many male members of the local Caribbean community. About his use of color in these series could be noted that each of these paintings is rendered as a basic tricolor flag: earthy red carpet, blue walls, white ceiling. In his art can be seen that he depicts sites of leisure, where the mind is usually free to wander. Colin Perry in Frieze Magazine described the artist’s work as “a vision of an awkwardly accommodated immigrant culture”. Because he was raised in the rainy and gray English Midlands, he always had a vision of warmer, more colorful country. Paintings of the Caribbean he created show this kind of perception. His paintings engage with the traditions of landscape painting and the history of abstraction. It could be said that his art is somewhere between abstraction and figuration. 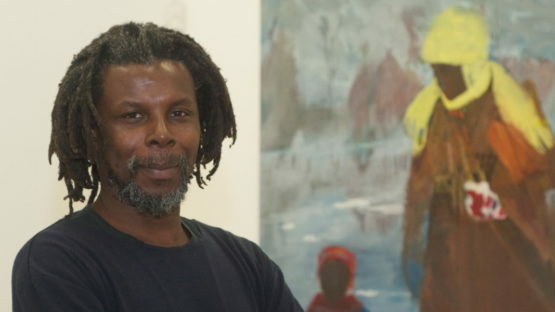 Subjects of his paintings are developed from both of the Jamaican and British culture, and he prefers to create his works rather from photographs, than memory. Besides his tendencies to use warm and earthly colors for his paintings, he is very well able to depict darker, quieter feelings, with an almost monochrome palette. His Untitled (Black Street) in blacks, grays and blues, depicts a night scene with an almost palpable tension. With these, limited tones, he captures a series of senses, rather than a visual description of this place, showing the cool damp stillness and deadened quiet of early hour suburbia. Unlike in his Untitled (Welcome Series) where he uses warm colors and cool whites and greys to transform the familiar contours of a street front store into a deceptively illusory space. For his work Anderson received, Alkazzi Travel Award, in 1996, in New York, John Crane Award, in 1997, also in New York, Caribbean Contemporary Arts Residency Programme, in Trinidad, in 2002, and a residency at Dulwich Picture Gallery in London, in 2005. His paintings have been exhibited in solo museum shows at Tate Britain, London, Studio Museum Harlem, New York, Michael Werner, New York, Ikon Gallery in Birmingham, England, Thomas Dane Gallery, London, and others. His work is held in significant public collections, including the Saatchi Gallery in London and the Museum of Modern Art, New York. Anderson is represented by Thomas Dane in London and Michael Werner in New York, and he has also been making prints at Durham Press since 2009. He lives and works in London, United Kingdom.